India is one of the 16 countries which a British non-profit organization, Global Witness, has identified where environmental activists were killed in the year 2015. 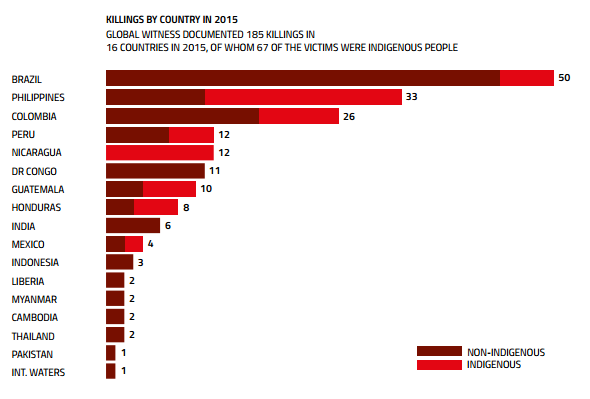 In its latest report, titled “On Dangerous Ground”, the top advocacy group has said, of the 117 non-indigenous people who died fighting for environmental rights worldwide, six were Indian. The report says, “Prior to his murder, he had faced considerable threats, including intimidation by the police and spurious legal charges in alleged retribution for his journalism.” Other countries from where examples of similar nature have been chosen are Guatemala, Myanmar, Peru, and Brazil. “The worst hit countries were Brazil (50 killings), the Philippines (33) and Colombia (26). Mining was the industry most linked to killings of land and environmental defenders with 42 deaths in 2015. Agribusiness, hydroelectric dams and logging were also key drivers of violence”, the report says. Regretting that the data it has collected, especially from Asia, may be inadequate, the report says, “In 2015, almost 40% of victims were indigenous.” None of those who have been reported killed in 2015 from India belong to the “indigenous” category – tribals.